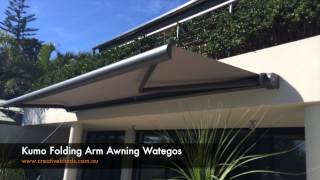 Maximise your outdoor living experience and add instant high fashion status to your home with our Fabric Folding Arm Awning. 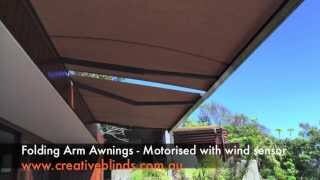 These retractable awnings provide a valuable shade extension to external living areas, such as terraces, patios, courtyards and balconies. They also work well with large floor to ceiling windows. This modern shade solution works well with both modern and more traditional home styles, and allows you to optimise use of the outdoors by offering effective weather protection. 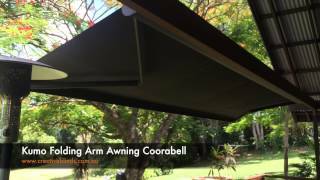 Folding Arm Awnings are the perfect solution for people looking for shade and weather protection without the obstruction of posts and beams. 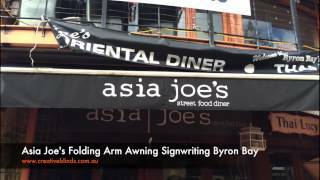 Unlike other awnings, the arm folds horizontally, allowing people to walk safely underneath the structure. 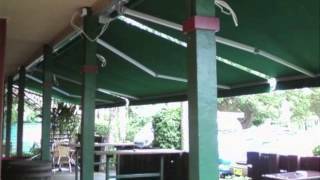 When not in use, the minimalist look is maintained as the awning neatly retracts into a roller tube. Starting from $2400 – Depending on fabric, style, accessory options and control options. Based on size 2750 x 1200mm. 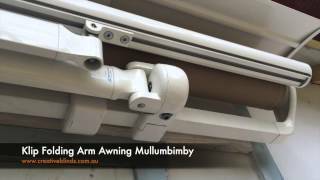 Creative Blinds are proud to represent Acmeda Folding Arm Awnings. With 4 styles to choose from, dependent on budget, application and aesthetic, we can provide a number of different solutions for patios, verandas and decks. Click To View Product Brochure. 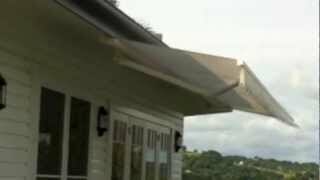 The KLIP traditional style awning features a vertical design best suited for open style wall applications. Finalist at R+T Innovation Prize 2009 in Stuttgart, Germany. Can achieve up to 14M widths & 3.5M projection. Die cast aluminium brackets and supports. Offering between 5 to 65 degree inclination. 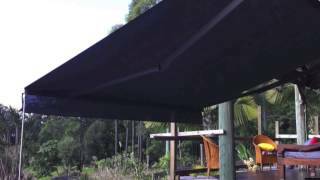 The KUMO awning boasts a smooth round fully enclosed cassette that contains very few components, making it easy to assemble and install. Can achieve up to 6M widths & 3M projection. Enclosed cassette, protecting blind when not in use. 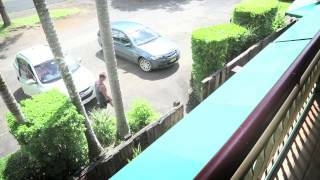 Offering between 5 to 85 degree inclination. 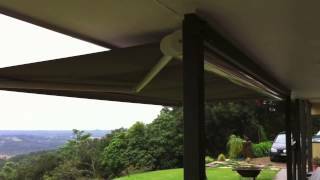 Amceda’s top of the range awning, Shan, offers state-of-the-art performance, built on ultimate design and functional qualities. A standout shading product featuring a contemporary enclosed square box offering an impressive 4M arm projection. Can achieve up to 10M widths & 4M projection. Easy to maintain without uninstalling. Additional gasket providing water damage prevention. Enclosed square cassette, protecting blind when not in use. Enhanced cassette aesthetics for optimal outdoor appearance. Offering up to 40 degree inclination. 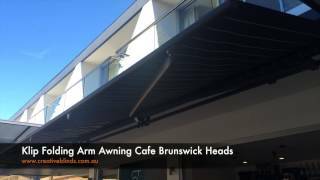 A traditional style folding arm awning, the Stein Awning features a more horizontal design, best suited for installation under roof eaves. Extensive range of colours and fabrics. 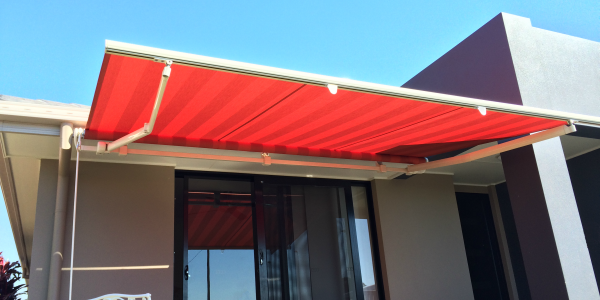 Can be fitted with adjustable pitch, achieving optimal sun and rain protection. 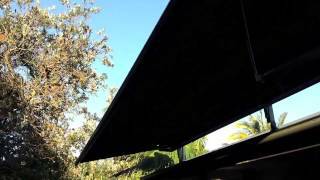 This feature allows you to change the angle of your awning to protect from the late afternoon sun or to use as a rain shelter in calm conditions. Can also be motorised and fitted with heat and wind sensors.